I must admit I'm a little nervous about writing book two. This trilogy has been in my mind since 2006. I wrote the first draft of Reborn in 2009. I rewrote Reborn in November 2012 and finished up in April 2013. Now, I'm writing book two. In November I'll be writing book three, Redestined. To think in a few short months I'll have the entire trilogy written. A trilogy that I've spent seven years daydreaming about. It's kinda scary. And exciting. And what if I completely screw the entire thing up? If I keep to my schedule, I will be sending Reforged to beta readers and getting ready to edit Redestined when Reborn comes out next May. Besides my critique partners and beta readers' reactions and perhaps a few early reviews, I won't even know how people will receive Reborn. True, I think it's awesome, but I don't count. Would I have wasted a bunch of time on books two and three, if no one likes book one? Plus, I'll be working on the companion trilogy (The God Challenges, featuring the seventh and last Phoenix Prophetess), so there could be six books in the end that no one will like except me. And yet, I still feel compelled to write them, even if I'm the only one who likes them. Apenth (God of Prophecy, Wisdom, Music from the trilogies) would likely curse me if I didn't write them. Heh. So, I will keep writing, even if it's just for me and a handful of others. Have you written a book two or multiple books in a series? How did you overcome the doubts? Did you write the books before book one was published? Or after? Fellow Untethered Realms author Graeme Ing recently interviewed me here. 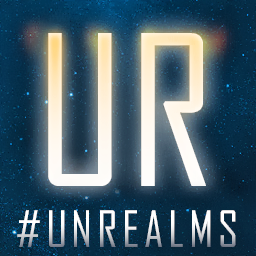 I'm talking about Foxwick, The Fate Challenges, Untethered Realms, and am revealing a secret about myself. 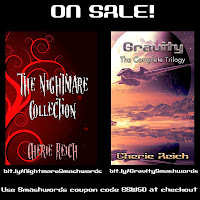 Also, Smashwords is once again having its Summer/Winter Sale. 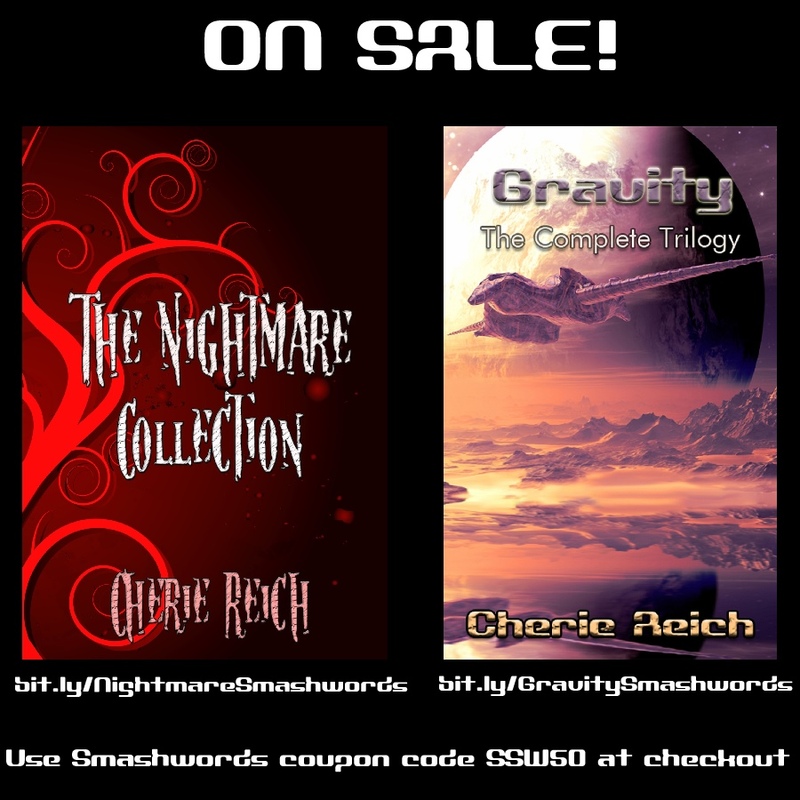 Through the end of July, you can purchase the ebook of Gravity: The Complete Trilogy and The Nightmare Collection for $1.50 using the coupon code: SSW50. I don't count - funny! Yes, welcome to the fear that goes with book two. And book three. The good news is that with every book you write, you get better. And by writing all three so close together, you'll be able to fix plot issues and make the story thread stronger. I didn't even start writing my second one until after my first was published. Trust me, that's the hard way to do it. I'm still struggling with getting book one edited and put together, meanwhile I have had book two just hanging around in my head waiting to be written for the past three years! Oy. I feel like no matter what book you are working on in the series you will give it your all and be completely and fully vested in it until it's done! Keep it up. If you keep writing books you love, you'll eventually find an audience. I'm in a similar position with my series. The first book's being published in September and the other books in the series are in varying stages of completion so it gets very confusing! Book 2's with beta readers, Book 3's had one major edit, and I'm midway through the first draft of Book 4 (with Book 5 outlined). I have a fear of being put off by bad reviews, or worse, the first book being ignored entirely, but I really want to finish this series even if by the end I'm the only person left to read it! Have I ever written multiple books in a series? Yes -- doing that right now! How did I overcome the doubt? I'll let you know when/if I do!! Book 2 is written, and while it's not as polished as it will be after my editor gets her hands on it and conducts revisions, I think it's a good story. Book 3 is worrying me. Because it is supposed to be either the end of a 3-book series or the midpoint in a series of 5. (The publisher has yet to decide.) So how do I make it good enough to be either?! Forget how I'll deal with the ending (which could vary, depending on whether the series continues). How do I produce the right amount of heart-pounding tension and action that will make it successful either way? I'm working on book 2 right now too, but I did write a really crummy first draft before I finished editing book 1, and I ended up putting a tiny bit more foreshadowing into book 1 because of that. However, now that I'm into book 2 - going as a Rebel Revision Camper to Camp WriMo, I'm struggling with those same kind of doubts - especially when I've made some big changes from my first draft to my second. However, I don't doubt that we will all love your trilogy. You are a talented, imaginative writer. This is me right now too! I'm writing Book 2 while Book 1 is out with betas and ready to query. It's coming together MUCH faster than I thought, but not nearly at the pace you're aiming for with Camp NaNo. Go girl! For one of my earlier series, I made sure I was about 2/3 of the way through a draft of Book 2 by the time I queried Book 1. With my WIP I feel like books 2 and 3 should follow it but the idea of that makes me so nervous. The book is awesome. So no worries! Yet I do understand. You just have to push on ahead. Your passion for the books will show. Oh my goodness, this is so spot on. I'm not doing NaNoWriMo, I just can't write that fast, but the thought of writing the rest of a series is scary and exciting for me too. My biggest fear is that I'll completely bungle it. I just keep writing anyway and try to ignore the doubts as much as possible. Good luck working on them! I hope it all works out well for you! You will find tons of people who like your trilogy just as much as you. I know it. Still, I understand your fear. I have a sequel sitting on my laptop that I'm struggling with. The first draft was finished and I started editing, but the whole time I'm worrying how people will like it compared to the first one. Then I found a plothole that needs to be worked out and ended up setting it aside. Yeah, I know, I'm ignoring the problem when I should be fixing it. I've LOVED reading these Indie posts today. I really do respect Indie authors so much. It seems like a scary undertaking! It does seem scary but it is not. Keep doing it. Keep writing. Your work will speak for itself! I think it is great that you have set a goal for yourself and you are working towards it. if you don't get it all written during NaNoWriMo- then you will still be further along than you were a month ago. I think if you have been daydreaming about the series for 7 years- it has got to be good. :) Happy writing! Sure your opinion counts. If you say it rocks, I'm sure it does. I haven't yet written ahead in a series, but I do plan ahead. In the future, I'll plan to write the first two in a series and release them close together. That seems to help. It's amazing to have something in your mind come to life on the page. You go girl! I get nervous thinking of writing the rest of a trilogy too. My thoughts are vague and I wonder if I can do it. Good luck with all your goals. Indie Life sounds great, and I hope it reaches and helps as many people as Alex's IWSG hop does. I can't say anything about writing a book 2, since I can't seem to write a book 1! But, I'm trying to get over my own perfectionism that won't let me do what I need to do, too. I think it's highly unlikely that you'll write 6 books that no one will like. HIGHLY unlikely! And like I've said before, I really admire the fact that you want to get the trilogy written before you publish the first book. Patience, indeed! I can totally relate to this as a comic creator, btw. I make my strips months in advance, and even have years' worth planned on top of that. I'm always afraid no one will like my webcomic, or anyone who does at first will eventually grow to hate it and stop reading before I can ever post the end. I keep plugging away, though, since doing anything but is simply unfeasible, even if I'm the only one enjoying my work in the end! I'm sure that you won't screw it up! You have a lot of writing goals Cherie. You inspire me to do the same, write one chapter a day. Good luck with your series! I'm editing book 2 in my series at the moment, so I know how daunting it can be. Sitting here wondering if it will measure up to book 1, and please the readers who are waiting for it. I think being a writer is always a little nerve wracking, no matter what stage you're at! Best of luck... I'm doing that now, and it's a bit tricky - at least for me, it's tricky since I've only ever written one story at a time. Sequels are inherently tough. I'm revising one this week, and it's been difficult to push through the doubts. Will it be as good as the first one? Will readers like it as much? I have to focus on telling the story I want to tell and not worry about anything else at this point.